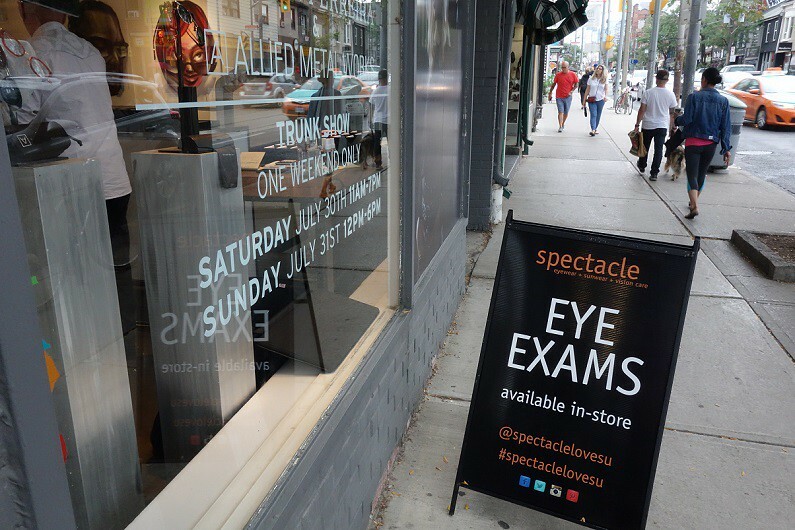 Spectacle – Distillery District went red with Ray-Ban popup banners and window decals on Saturday July 16th, and Sunday July 17th 2016 to promote very special trunk show displaying dozens of new eyewear designs from this pioneer brand. 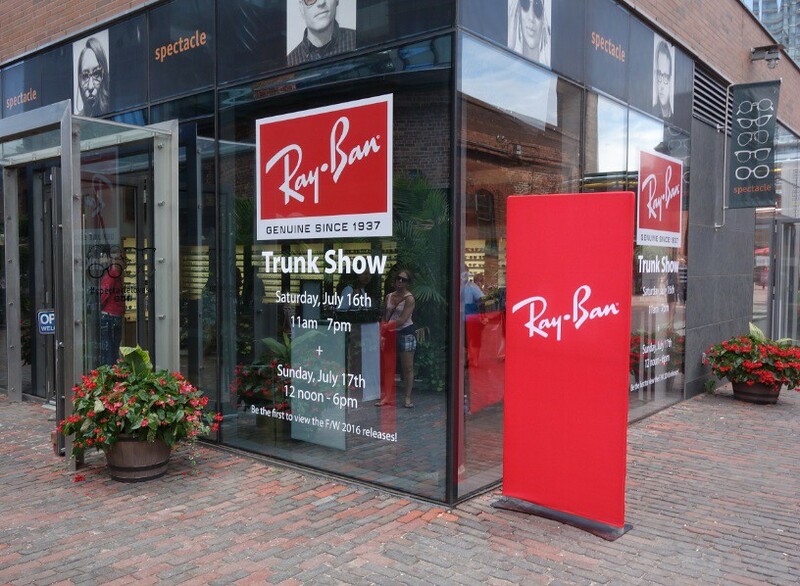 Bright red posters lite up the historic Distillery District area of Toronto telling everyone there’s a Ray-Ban trunk show happening here! The Distillery District works hard to maintain their 1870’s Victorian architecture and so our store inside this timeless venue is the perfect place to showcase this historic company’s new work. Few modern fashion brands are as old as Ray-Ban. Aviator sunglasses, or “pilot’s glasses”, were originally developed in the nineteen thirties by the US air force specifically for pilots to protect their eyes while flying, thus the name aviator. In the nineteen forties, Ray-Ban Aviator style sunglasses first became associated with US fighter aces and bomber captains. But then Aviators jumped forces after General Douglas MacArthur landed on a beach in the Philippines in World War II and newspaper photographers snapped several pictures of him wearing the glasses. This really blew up the brand and is today considered a pivotal moment in the evolution of modern eyewear. On that day Ray – Ban conquered America. Legend is that the original Wayfarers were intended to be marketed only to men, but women soon fell in love with the sleek, shiny design that can flatter any shape of face. The cool new Ray-Ban sunglasses soon began to turn up on everyone famous from Presidents and hipsters. Wayfarers got their MacArthur moment when Audrey Hepburn’s Holly Golightly wore Wayfarers in the 1961 movie Breakfast at Tiffany’s. Throughout the 50s and 60s, Ray Ban Wayfarers were the sunglasses of choice for screen icons like James Dean and Marilyn Monroe, and influential recording artists as varied as Bob Dylan, Roy Orbison, and John Lennon. After sales slumped in the seventies, Bausch & Lomb signed a multi-million product placement deal in the early eighties to place the brand’s classic models in mainstream media films and TV shows which is a risky move. The Aviator model was notoriously present in Cobra and Top Gun and it really paid off – according to Wikipedia in the year 1986, Ray-Ban Aviators saw a 40% rise in sales. In 1999, Bausch & Lomb sold the brand to the Italian Luxottica Group for a reported $640 million. In 2007, Ray-Ban re-introduced the original Ray-Ban Wayfarer design but expanded the color options beyond the traditional palette to include patterns like checks and camouflage and colors like navy, white, turquoise, red, and blue. 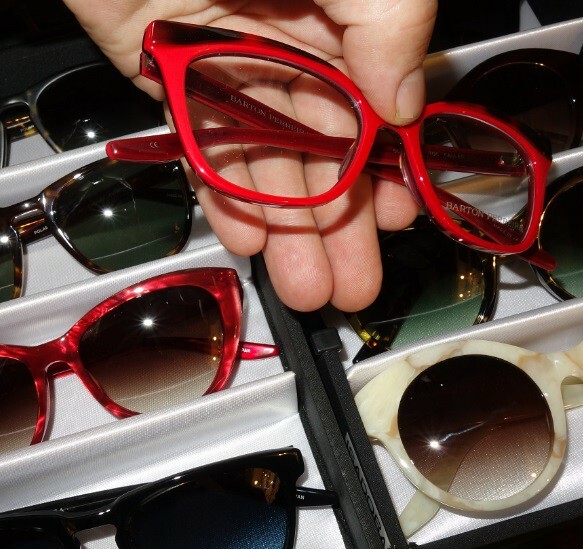 They also created a line of multi-colored Wayfarer frames that combined colors like gold on black, white on black and red on tortoise-shell. The strategy worked, and once again Ray-Bans adorned celebrities faces on tabloids and in video clips on entertainment gossip television shows. After a decade away from the cameras, Ray-Ban was suddenly cool again and even the original Aviator-style, longtime associated with cops and pilots, began showing up on celebrities. 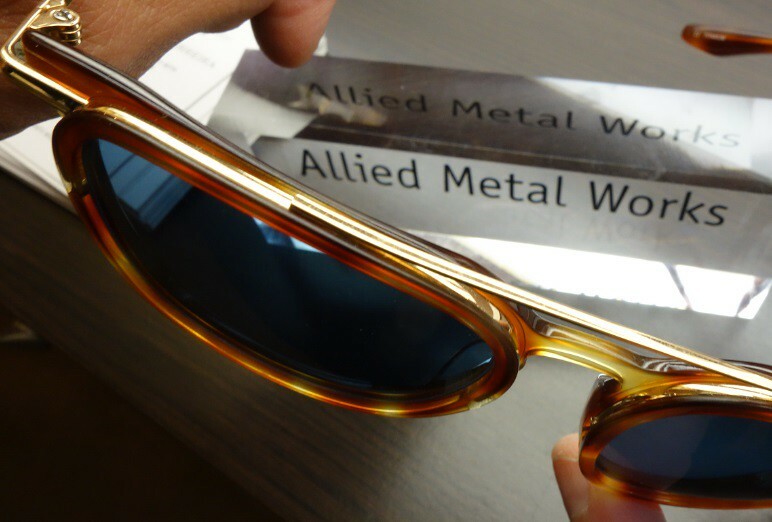 The latest Ray-Ban sunglasses look as good as ever – more pictures coming. Happy Canada Day from Spectacle! Happy Canada Day from all of us at Spectacle! To celebrate, our Queen St. and Yonge St. locations will be closed tomorrow, Friday July 1st, and re-open Saturday, July 2nd with regular hours. 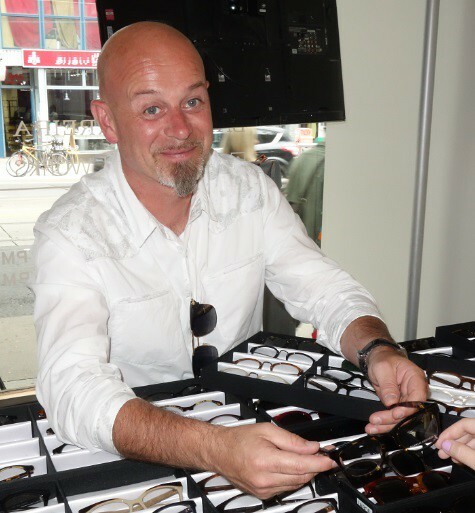 The Distillery District shop will remain open on Friday for all of your eyewear needs and, like always, our new online shop is open 24/7! Enjoy the day off with a few brews and poutine, and we’ll see you Saturday!